Some vegetables are better for us after they’ve been cooked. How do you know which ones? It’s mostly the red and orange ones… Like tomatoes and carrots. Food science professor Dr. Mary Ellen Camire says those vegetables have tough cell walls that can lock in all the good stuff, like vitamins and minerals. But cooking helps break down those walls so we can absorb the nutrients more easily. So, remember, red and orange vegetables are healthier when cooked. Carrots, celery, and green bell peppers. They’re all top sources of luteolin… According to the Journal of Nutrition, that’s a nutrient that reduces the risk of dementia. Not into salads? Try cooking with olive oil, or drink peppermint or chamomile tea for your luteolin boost. Stress does more than make us crave comfort food – it can also change how our food tastes! A new study in the journal Neuroscience Letters found that our taste buds actually contain receptors for certain stress hormones. Which means, when we’re stressed, a cookie won’t taste as sweet, and a bowl of cheese doodles won’t be as satisfying – and we’ll end up craving even more. The fix? 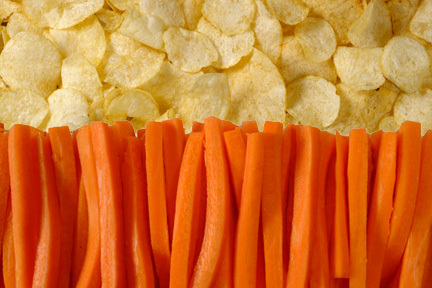 Munch on something crunchy AND healthy – like radishes or carrots. Studies show that can help reduce stress, because the act of crunching relieves tension in the jaw – but the veggies won’t add many calories. It’s time for chicken soup! It’s not just an old wives tale! 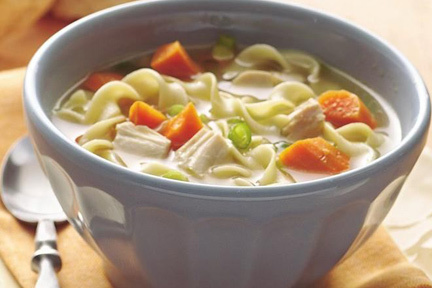 Chicken soup really is good for the common cold! 2. 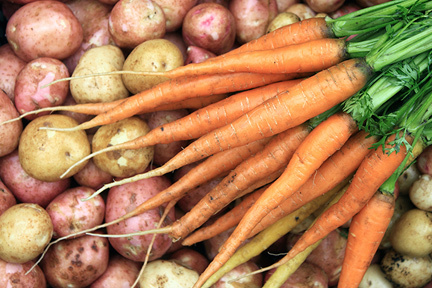 Veggies, like carrots and potatoes, boost your immunity – so you can fight off infection. 3. The broth can help clear your sinuses! Clear, thin fluids, like broth, thin out your mucus. Plus, staying hydrated helps your body fight infection. And warm fluids work best – because both the steam and the warmth can contribute to clearing the mucus, which will relieve your upper airway. Don’t cut your vegetables before you cook them. Scientists found that potatoes retain 50% more potassium when cooked whole, than when they’re chopped up. And carrots hang onto 25% more cancer-fighting compounds when cooked whole. And as a bonus, your food will taste better! According to researchers at Newcastle University in the UK, cutting vegetables into pieces before cooking them means that compounds such as sugars and acids leach into the water – which causes them to lose flavor. 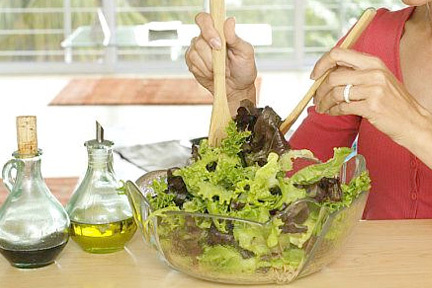 Did you know your fat-free salad dressing could be working against you? That’s because we need a little fat to absorb the nutrients in vegetables! Things like lutein, lycopene, and beta-carotene are antioxidants you’ll find in tomatoes, carrots and romaine lettuce, but they’re fat-soluble. So if you don’t eat them with a little fat in your dressing, you’ll miss out. So go for oil and vinegar instead of fat-free ranch.